The first interesting dynamic of soviet culture during the 1970’s was the level of alcohol consumption amongst the citizens. On page 659 of the Russia Reader there is an an anecdote to depict daily life for the soviets during the 70’s that points out how much the soviets drank. The alcoholism was a “staple of Soviet life” (Russia Reader). Also from Communal Living in Russia, there is a photo of the electricity installed in one of the houses. While it looks old, it is a part of the dynamic to Soviet life making the world a smaller place by having electricity for every house so they can communicate and operate modern appliances. The link to the photo is below. From Seventeen Moments (1973) there is an article which talks about how pop was a new creative style of music that was a fresh change from the “bland” stage performance music that all sounded the same. The link to the article is below. The word “bland” was used in the article to describe the stage performance music in the article as well. The new style of music also was a dynamic in the music that Soviets were exposed to during the advancement of socialism in the 1970’s. Barker, Adele Marie, and Bruce Grant. 2010. The russia reader: History, culture, politics. Durham, NC: Duke University Press. The Big Deal was a social reconstruction of Soviet culture after the war that instituted new ideas to include a boost in the economy. My post will focus on this exactly looking at an artifact from Mass Culture in Soviet Russia edited by James con Geldern and Richard Stites. The piece I looked at is from page 411 of the book that is titled “Cossacks of the Kuban”. This is a script for a Stalinist postward film that depicts an economy in Russia that was more developed than it was at the time. Fields of Grain to be harvested and traded and markets full of consumer goods were depicted in the film to propose an idea of boosted economy for the Soviets (p.411 of Mass Culture in Soviet Russia). This is still a communist country but this new idea of a boosted economy almost entertains the idea of moving towards a more capitalist framework in the sense of economics. One of the main reasons why the Soviets were victorious in World War II was because of their sheer numbers and size. The country was so large that naturally it contained more people than Germany. The Soviets could then pull more people from their country to fight, and they could also pull more people to help build and maintain weapons, vehicles, and other machinery for the war. In a subject essay on the Seventeen Moments part of our website, there is a statistic that is the number of troops, tanks, and aircraft the Soviets had against the the Germans during the Battle of Kursk (which the Soviets won). It is easy to attempt to win a battle with more people to fight, people to contribute to the fight, and machinery to use against the enemy. On page 338 of our Mass Culture book, there is a literary piece that is derived from Aleksei Surkov who was a front-line correspondent during the war. In the literary piece, he talks about how a solider was captured by the Germans and was treated very, very, poorly. This is one of the reasons that the Russians wanted to fight the war. The Nazis initiated conflict into their country and thought of the Russians as a race that was inferior to theirs. The Nazis did not treat Russian prisoners of war as they should have. Mass Culture in Soviet Russia, page 338. The reason why I chose this topic is my interest in how the proletariat class reacted to the decrees of Stalin. Stalin’s plan was to industrialize and improve the way of life for everyone by government mandating the collecting of crops and agriculture in general for the people. The interesting part about this is that though he had these positive intentions for him and his people, they did not turn out so well for them. Famine ensued with the push to turn agriculture into something that the government had watch over. What I learned was that the peasants did not want at all to work on these “collectivized” farmlands. They rioted and violently protested by slaughtering their livestock, destroying and vandalizing farmland property (government property) and working at a very slow and unproductive pace. Their slow pace of work made it impossible for government overseer’s or the Kolkhoz administration to make their quotas. (Info is from the website listed below). The cultural artifact that I examined was a piece of propaganda (shock workers). 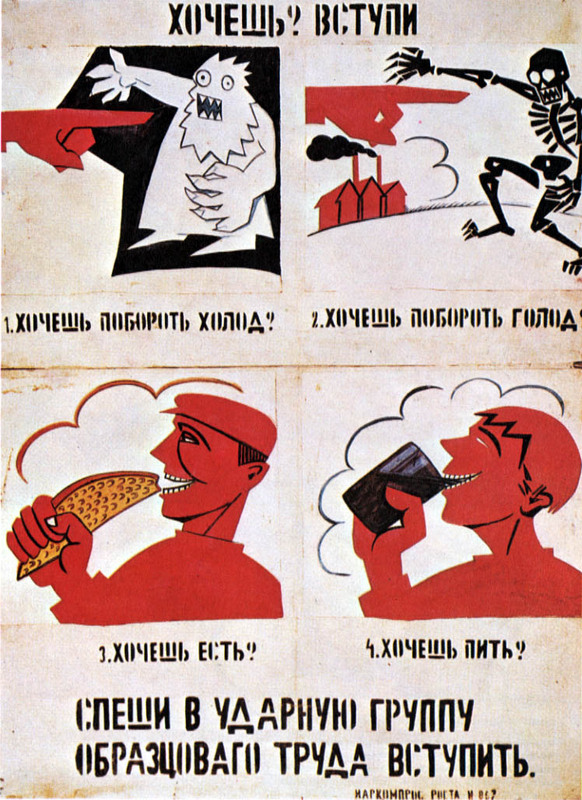 This piece of propaganda was meant to make known of the demand for shock workers (or workers who had an especially difficult and arduous task) and their task to meet and exceed the quotas for the government run agriculture (sources from http://soviethistory.msu.edu/1929-2/shock-workers/). The environment for these workers was not pleasant at all, and the pay was so minimal it did not support the workers or their families. The harsh conditions and lack of pay made for reluctant workers and a lack of productivity. This lack of productivity caused a massive famine. The cinema was really the only practical application of new life technology for the Soviets during the time of the revolution. New found technologies such as airplanes and cars were not something feasible for everyday use by the Soviets. During the revolution when the Bolsheviks were making films, they were not very well done and and were of very poor quality. However when the civil war ended and Western films were allowed back into the Russian market, the Soviets were able to see how much better they could make their films by adding stunts and actual footage from real events. So, to touch on “what is revolutionary culture” I would say in this context that it is a culture that is very uniquely dismal when compared to the culture of the rest of the world at the time. The soviets were shut out from what was going on with the rest of the world, so their own little culture was decreased in growth and prosperity because how long they were not in tune with what was going on with the rest of the world. Also because of all the bloodshed and hardship from the revolution, there was not very much “culture” for them. What I mean by that is every one was so depressed and poor from war that they resorted to alcohol, particularly vodka which was a really really cheap way to make things in life seem a bit better for just a while. This week’s blogpost is about a Russian futurism. This idea and style of both art and literary work had a very prominent Russian figure named Vladimir Vladimirovich Mayakovsky. The idealism behind this was to get rid of the normal traditional ways of Russian life, and to embrace industrialism and change within their society. Russian futurists liked the idea of of modern machines and urban life (wikipedia). Within their paintings such as one called Cyclist, there is a bike with a bike chain, indicating the Russian futurists fascination with machines and how they are going to be a huge part of the future. On wikipedia, it says that “The likes of Pushkin and Dostoevsky, according to them, should be “heaved overboard from the steamship of modernity”. The “creator” that we are focusing on for the purpose of this class is Vladimir Vladimirovich Mayakovsky. According to wikipedia, he was a Russin Soviet poet, playwright, artist and stage and film actor. Most of the influence of his work was in support of the Communist Party (wikipedia). Being a futurist, he was a supporter of the Bolshevik Revolution and the idea it brought with the overthrow of the traditional government that was in place (wikipedia). There is a poem that Mayakovsky contributed to called A Slap in the Face of Public Taste that has line which says “Wash your hands which have touched the filthy slime of the books written by the countless Leonid Andreyevs.”. According to wikipedia, Leonid Andreyevs was a writer and defended democratic ideals during his time at the end of 19th and beginning of the 20th century. Mayakovsky and his Futurism counterparts wanted to express in this specific line of the poem that people should abandon their old traditional ways to make way for new and fresh ideas. The painting that I have decided to talk about is the painting of the men who are alongside the shore pulling a boat with ropes and straps. The title of the painting is noted above. I find this piece of art very interesting because of how the painting overemphasizes the persecution of the workers in the photo. They are pulling the boat with ropes and straps that seem to be gnawing at their clothes and skin and are not in any comfortable position whatsoever. Next, the boat that they are pulling does not have its sails up at all, whereas the boat in the background (the boat to the left as you look at the painting) does have its sails up and is sailing down the river with ease. This implies that the boat that the workers are pulling could possible be sailing but the leadership on the boat has decided to be lazy and use the workers anyways. Also in the background of the painting (to the right) is what appears to be a steamboat. This also contributes to the extreme emphasis of this photo with the fact that there is another way of transportation for boats besides using manual laborers. What I have found about this painting is that is was based off of a real photo of four men who are doing the same type of work. Also, what I thought before was a person who was in charge of the men was actually a laborer. I got this information from wikipedia. The link to this source is below. This young man (centered in the center of the picture) is dressed very well and is standing straight up with confidence and perseverance to endure his hard labor. Also, this painting was exhibited in the 1873 International Exhibition in Vienna (wikipedia). It was purchased by Tsar Alexander II’s son (wikipedia). I also learned from wikipedia that the men are actually pulling the boat upstream. This is just another factor to emphasize the ludicrous backbreaking work of laborers during that time.